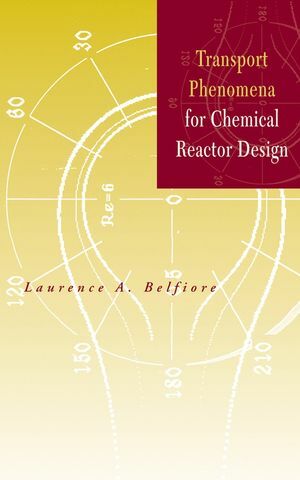 Laurence Belfiore’s unique treatment meshes two mainstream subject areas in chemical engineering: transport phenomena and chemical reactor design. Expressly intended as an extension of Bird, Stewart, and Lightfoot’s classic Transport Phenomena, and Froment and Bischoff’s Chemical Reactor Analysis and Design, Second Edition, Belfiore’s unprecedented text explores the synthesis of these two disciplines in a manner the upper undergraduate or graduate reader can readily grasp. In addition to its comprehensive treatment, the text also contains 484 problems and ninety-six detailed solutions to assist in the exploration of the subject. Graduate and advanced undergraduate chemical engineering students, professors, and researchers will appreciate the vision, innovation, and practical application of Laurence Belfiore’s Transport Phenomena for Chemical Reactor Design. LAURENCE A. BELFIORE has been teaching and conducting research in the chemical engineering department at Colorado State University for eighteen years. He has published forty-two journal papers, five book chapters, and thirty-four proceedings, and presented eighty-eight symposia talks. PART I: ELEMENTARY TOPICS IN CHEMICAL REACTOR DESIGN. Multiple Chemical Reactions in Plug Flow Tubular Reactors and Continuous Stirred Tank Reactors. Start Up Behaviour of a Series Configuration of Continuous Stirred Tank Reactors. Adiabatic Plug-Flow Tubular Reactor That Produces Methanol Reversibly in the Gas Phase from Carbon Monoxide and Hydrogen. Coupled Heat and Mass Transfer in Nonisothermal Liquid-Phase Tubular Reactors with Strongly Exothermic Chemical Reactions. Multiple Stationary States in Continuous Stirred Tank Reactors. Coupled Heat and Mass Transfer with Chemical Reaction in Batch Reactors. Total Pressure Method of Reaction-Rate Data Analysis. PART II: TRANSPORT PHENOMENA: FUNDAMENTALS AND APPLICATIONS. Applications of the Equations of Change in Fluid Dynamics. Derivation of the Mass Transfer Equation. Dimensional Analysis of the Mass Transfer Equation. Laminar Boundary Layer Mass Transfer around Solid Spheres, Gas Bubbles, and Other Submerged Objects. Dimensional Analysis of the Equations of Change for Fluid Dynamic s Within the Mass Transfer Boundary Layer. Diffusion and Chemical Reaction Across Spherical Gas-Liquid Interfaces. PART III: KINETICS AND ELEMENTARY SURFACE SCIENCE. Kinetic Mechanisms and Rate Expressions for Heterogeneous Surface-Catalyzed Chemical Reactions. PART IV: MASS TRANSFER AND CHEMICAL REACTION IN ISOTHERMAL CATALYTIC PELLETS. Diffusion and Heterogeneous Chemical Reaction in Isothermal Catalytic Pellets. Complete Analytical Solutions for Diffusion and Zeroth-Order Chemical Reactions in Isothermal Catalytic Pellets. Complete Analytical Solutions for Diffusion and First-Order Chemical Reactions in Isothermal Catalytic Pellets. Numerical Solutions for Diffusion and nth-Order Chemical Reactions in Isothermal Catalytic Pellets. Numerical Solutions for Diffusion and Hougen-Watson Chemical Kinetics in Isothermal Catalytic Pellets. Internal Mass Transfer Limitations in Isothermal Catalytic Pellets. Diffusion Coefficients and Damkohler Numbers Within the Internal Pores of Catalytic Pellets. PART V: ISOTHERMAL CHEMICAL REACTOR DESIGN. Isothermal Design of Heterogeneous Packed Catalytic Reactors. Heterogeneous Catalytic Reactors with Metal Catalyst Coated on the Inner Walls of the Flow Channels. Designing a Multicomponent Isothermal Gas-Liquid CSTR for the Chlorination of Benzene to Produce Monochlorobenzene. PART VI: THERMODYNAMICS AND NONISOTHERMAL REACTOR DESIGN. Classical Irreversible Therodynamics of Multicomponent Mixtures. Molecular Flux of Thermal Energy in Binary and Multicomponent Mixtures Via the Formalism of Nonequilibrium Thermodynamics. Thermal Energy Balance in Multicomponent Mixtures and Nonisothermal Effectiveness Factors Via Coupled Heat and Mass Transfer in Porous Catalysts. Statistical Thermodynamics of Ideal Gases. Thermodynamic Stability Criteria for Single-Phase Homogeneous Mixtures. Coupled Heat and Mass Transfer in Packed Catalytic Tubular Reactors That Account for External Transport Limitations. This unique treatment meshes two mainstream subject areas in chemical engineering...transport phenomena and chemical reactor design. Simultaneous consideration of both kinetics and heat transfer, critical to the performance of real chemical reactors. 484 problems and 96 solutions.